We have a flurry of information to bring you regarding Mariah and Kaver’s offspring, so here we go! We begin with some really terrific news. Our colleagues at the Cleveland Museum of Natural History have had a falconcam of their own focused on the pair at the Terminal Tower for many years. Now it appears they have another pair in town. Our very own Seneca from 2008 appears to have displaced another female named Ely and taken over a nest site on the Brookpark Road Bridge just outside of Cleveland! Not only that, but she has a mate named Cheynne. He was also hatched in 2008 from a nest in nearby Akron, Ohio. It hasn’t escaped our notice that both of these falcons carry the name of a Native American tribe. What a wonderful coincidence! Isn’t she gorgeous? Our sincere thanks go out to Chris and Chad for the excellent pictures, and to Kim for finding Seneca. You can follow Seneca and Cheyenne as they build their new family on the Seneca thread in our Forum. Rhea [Mae] had been spending many nights sitting at the nest ledge. But last night she was on the nest tray. After dark she climbed into the tray and laid down. This morning, egg # 1! It looks like 2010 will be another productive year for Rhea Mae, Mariah’s daughter from 2006. You can follow all the news about her at the Rhea Mae thread in our Forum. Quest has had one of her busiest weeks yet, covering several hundred miles from as far north as Ottawa and Montreal, down south to Lake Erie. In between she spent a few days at her familiar hunting grounds near the Lennox Power station and at Prince Edward Point. It’s anyone’s guess as to where Quest will settle down, if she ever decides to stop globetrotting, that is! It looks like Archer and Beauty are getting right down to the business of courtship. 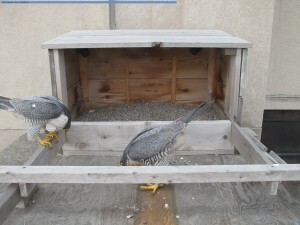 Our on-the-ground watchers report seeing courtship behaviors, and a look at the cameras at Times Square confirms that both falcons have been seen at the nest box bowing to each other. Bowing is a typical courtship activity, which is usually accompanied by both birds vocalizing to each other. Another sign of courtship is that the male will bring gifts of food to a female (kind of like a man picking up the dinner tab for a date, or bringing chocolates to his valentine!). This demonstrates his ability to provide for a family, not to mention his skill as a hunter. Courtship also allows the Peregrines to renew their pair bond after their winter separaton. 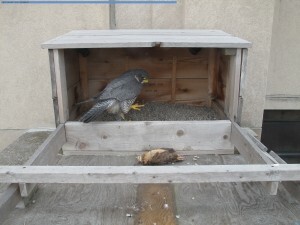 As you can see, Archer has dropped off a nice fat Woodcock at the nest box. Beauty showed up a minute after the delivery (that’s her in the picture– thanks Ashira for the catch!) but she didn’t take the bird, perhaps because she’d already eaten. After she left Archer returned, grabbed the food and took it with him around 10:37. You can follow the action in this time lapse sequence brought to you courtesy of the Rochester Falconcam Archive Viewer (click the image below to watch the movie). There’s been more courtship observed at the nest box today, so we’re looking forward to Archer and Beauty continuing to re-establish their pair bond. And as posted by Falconcam team member Carol Phillips over at our FalconWatch blog, they’ve already moved to the next step, mating! If you’ve been keeping an eye on the Rochester Falconcam’s cameras, the FalconWatch blog or our recently enhanced Forums (all easily available thanks to our new and improved menu bar at the top of the page), you’d know that while Beauty has been spotted throughout the winter, we’d had no sign of Archer. A few weeks ago Beauty was seen at the nest box in the company of another male, but he left the area after only a short stay, and the best guess from our volunteer watchers is that the tiercel was probably one half of a pair that was just passing through town. Truth be told, we were all starting to wonder how 2010 was going to shake out. It’s getting pretty late, and in years gone by we’d have expected courtship and even mating activity to be well under way. So I’m sure you’ll be able to appreciate the excitement we’re all feeling here at the Rochester Falconcam to see that on this inuaugural day of Spring, Archer has returned home! The picture at the top of the page was captured by our super high-resolution Main Camera, another brand new feature that we’re happy to bring you. 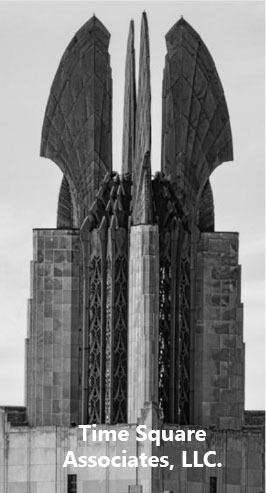 That’s Beauty in the middle, bowing. And on the left is Archer, his 25/V ID band clearly visible. His return is fantastic news! We’re hopeful that this year will prove to be more bountiful than Beauty and Archer’s rookie season in 2009. Of course nothing is certain (Specto Subitus, as we like to say), but seeing Rochester’s resident Peregrines back together is a wonderful way to welcome Spring back to Western New York! We have watchers on the ground today so keep your eyes on the FalconWatch Blog for all the latest updates. The past few days have found Quest continuing her westward move. She spent a couple of days in Port Colborne, in pretty close proximity to the Archer Daniels Midland mill where Freedom had been the resident male until 2009. Then yesterday he headed north to the Royal Botanical Gardens in Hamilton. Of course, Hamilton has a resident Peregrine pair, Madame X and Surge. According to Hamilton resident and Falconcam fan David Bevan, Madame X is very territorial. Hopefully Quest won’t get herself into any trouble while she’s touring along the west end of Lake Ontario! Within the past few days Quest has expanded her travel range, heading north on the 6th into Ontario’s countryside near Clyde Forks and the Lanark Highlands. On the 8th it was back to Prince Edward Point, only to journey west following Highway 401 into Toronto. The evening of the 9th showed her at what appears to be a large retail building in the 1100 block of Leslie Street, just north of Eglinton Ave East, and adjacent to the well wooded Willet Creek Park. 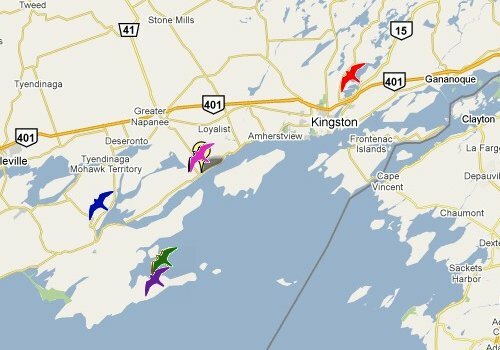 Continuing her trend from the end of February, Quest has been spending her days moving between Prince Edward Point and southeastern Ontario. The early days of March provided clear weather with a lot of data points. The information from the transmitter’s temperature sensor shows that Quest is having no trouble keeping warm. And with the end of winter coming, it will be interesting to see whether she stays at PEPBO, moves back to Lennox, or strikes out in a new direction. She’s also fully adult now, so she ought to be looking for a mate as well. Sitting on a major migration route as she is, it seems likely that she’ll attract the attention of a Peregrine tiercel before too long. You are currently browsing the Imprints blog archives for March, 2010.